The timing of an array of ultra-stable pulsars works like a giant galactic detector to observe gravitational waves in the nano-Hertz domain. The timing of pulsars in compact binary systems also enables stringent tests of gravitation theories in the strong field regime. The timing of an array of ultra-stable pulsars works like a giant galactic detector to observe gravitational waves in the nano-Hertz domain. Three European consortia (EPTA in Europe, NANOGRAV in North America, PPTA in Australia) have joined their efforts to provide the first constraints on gravitational emission from the population of super-massive binary black holes (between 10^8 and 10^10 solar masses) at the heart of merging galaxies, or from a network of cosmic string loops. 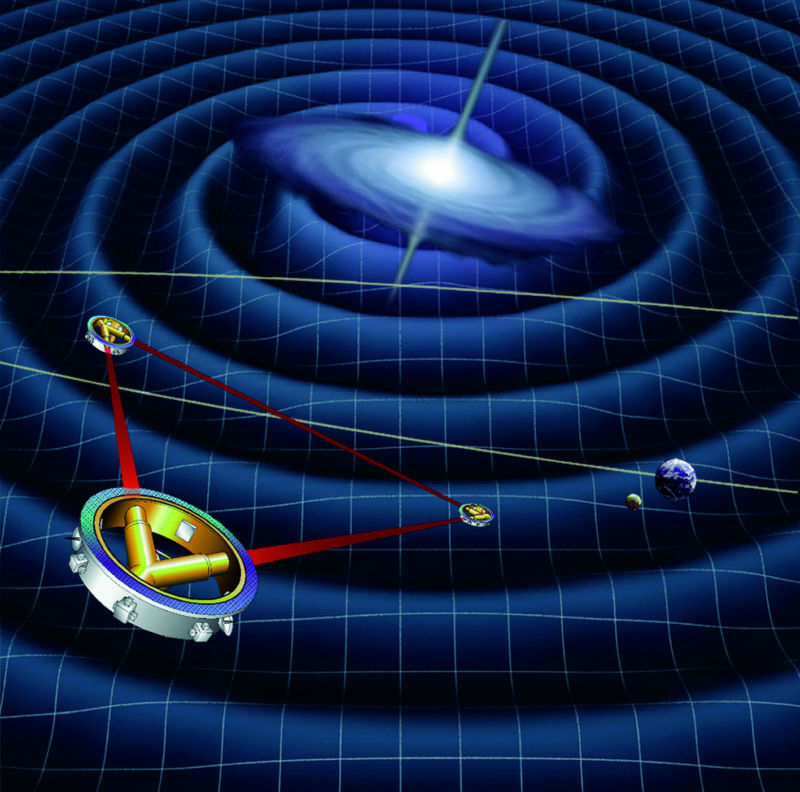 For the first time, the obtained limits guide theorists towards new and better scenarios of gravitational emission. The PTA program mobilizes 2300 hours of radio telescope per year at the Grand Radiotélescope Decimétrique de Nançay (NRT). Pulsar Timing Arrays (PTAs) provide the only window on nHz to µHz gravitational waves, emitted from e.g. super massive black hole binaries. The NRT records very high quality and high cadence data for PTA analyses. With orbital periods of a few hours, compact pulsar/white dwarf or pulsar/star-to-neutron binary systems are natural laboratories for testing theories of gravitation in the strong field regime. For the most interesting systems, the timing accuracy obtained with the best radio measurements makes it possible to measure all orbital, Keplerian and post-Keplerian parameters in only a few years. In addition to the precise measurement of the masses of the two components, which is very useful for all models of the internal structure of neutron stars, the following parameters can also be determined: the orbital precession, Shapiro effect parameters, the gravitational redshift, and the orbital decay caused by gravitational wave emission. In a few rare cases, the geodetic precession due to spin/orbit coupling is also measured, so that interesting upper limits can then be placed on the dipolar gravitational radiation resulting from the coupling between scalar and vector field (cases of very asymmetric binary), and on the time variations of the gravitational constant. The NRT is one of the few instruments in the world capable of providing the quality and data rate necessary for this type of application, in particular to properly sample the orbital phase of these systems. In addition to the PTA data, approximately 500 hours of telescope time per year are dedicated specifically to these studies, with the monitoring of 90 binary systems. The central region of galaxies hosts Super Massive Black Holes (SMBH). The measurement of SMBH accretion activity provides us with information on their population and stellar environment. In particular, the capture of a compact object of 10-100 solar masses (case of an EMRI, for “Extreme Mass Ratio Inspiral”) by a SMBH is detectable thanks to the gravitational waves produced, but only by laser spatial interferometry. The compact object can then be considered as a probe of the SMBH gravitational field, making it an ideal source for strong gravity tests. Knowledge of the appearance of the gravitational signal, affected by the force itself (the entire radiation reaction due to the emission of waves and the non-radiative contribution due to the mass ratio), is essential for detection to be carried out, because unlike the binary of comparable masses, orbits are extremely complex (strong eccentricity, change in the orbital plane, resonances, zooms and eddies, couplings etc.). The compact object is modelled as a massive particle of infinitesimal size, which makes it possible to neglect its internal structure but introduces the difficulty of regularizing divergences. In Orléans, we developed a new strategy for calculating the waveforms emitted for all types of orbits in Schwarzschild-Droste geometry and analysed the regulation techniques for erasing divergences. We also studied iterative orbital evolution (the motion of the small mass is continuously corrected by the proper force) through the realization of a parallel numerical code (system of integro-differential equations with partial derivatives of the second order, by modes – spherical tensor harmonics – in the time domain) and determined the equation of motion and the geodetic deviation. Three other topics are studied: the possibility of detecting the same binary supermassive black holes before with pulsars and after with LISA in a sequential way, the theorems on entropy and the two-body problem, Newtonian and Einsteinian, pedagogy around the principle of equivalence and uniqueness of the fall in classical physics and in general relativity, gravitational radiation and Hawking.